SEOUL, March 24 (Yonhap) -- South Korean firms' investment in India topped the US$1 billion mark last year, more than doubling from a year earlier, largely thanks to massive investment projects by Samsung Electronics Co. and Kia Motors Corp., industry data showed Sunday. According to the data provided by state-run Export-Import Bank of Korea, South Korea's direct investment was tallied at $1.05 billion last year, a whopping increase from the previous year's $516 million. The country's direct investment was more than $300 million between 2012 and 2016. In 2011, the corresponding figure was $456 million, the data showed. 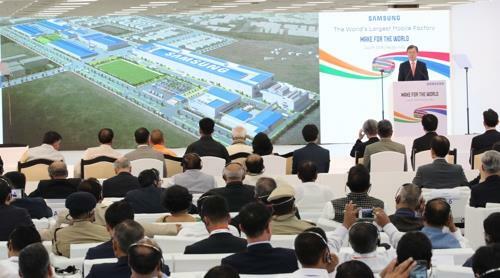 In July, Samsung constructed the world's largest smartphone factory, with an output capacity of 120 million handsets, in Noida, Uttar Pradesh, in the northern part of the country. Kia Motors, an affiliate of South Korea's top automaker, Hyundai Motor Co., is also building a plant in India that will produce 300,000 units. The data showed that 88.3 percent of the direct investment in India, or $930 million, was invested in the manufacturing sector, with the number of South Korean firms newly set up in India reaching 118 last year, slightly up from the previous year's 113.